‘Keyword Research’, here advertisers frequently get themselves stuck up as getting the same, repetitive, entirely drenched keywords again and again; alongside trying to dig deeper to find something new, something that hasn’t been covered earlier. Yes, it’s difficult as not being aware with the ways left untouched, unexplored and you without perfect suggestions. To help you in the case, we have dug out 6 lesser-known places to find new keywords that are traffic-driving too. Google Keyword Planner is the best free resource available to discover new keywords applicable to your niche by automatically generating keyword suggestions. Despite the fact that the most favored way is to use the “product or service” field, there is a “landing page” field too. Post one of your URLs here and get the recommendations different from the ones you find when searching by topic. Try pasting a couple of different URLs and it’ll give you a lot of keywords that have never been suggested. It’s an awesome approach to mix things up and get away from your keyword search complication. Taking a look at Internet forums fill in as a great way to discover topics that no one else has covered professionally. You can find the related forums in your industry; the procedure is really simple. Simply sort posts by traffic; search through the forums with your keyword tools. There is a great deal of unknown regions to be found here. These are absolutely different from the recommendations appeared after typing any topic into the keyword planner. And, is a great way to find ideas that you might have skipped otherwise. 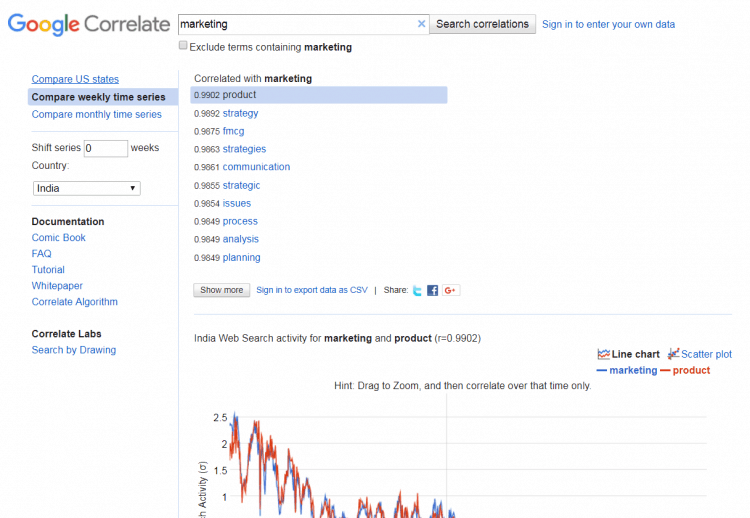 Google Correlate is one of the finest resources hidden among Google’s suite of free marketing tools. Using this tool you can simply know what other people are searching related to your keywords; simply a new way to research keyword popularity and trends. Google Search Console has a lot of keyword information to offer and allows marketers to sort them by clicks, impressions, click-through rate and position. Working differently when compared to other tracking tools, this one uncovers every keyword you are positioning for, which even include those not defined yet. So, you find keywords you haven’t explicitly targeted, with possibilities of bringing in good traffic. Here, you should start sorting by position and look for keywords bringing ranking at 10-30 positions. You’ll luckily get to know keywords you wouldn’t have thought of considering, but are positioning decently. It’s pretty realized that Google Trends is a tool helping you see the latest trends, data and visualizations from Google. In any case, the important thing to know is that here you can seek by particular businesses and also, narrow down the search results for particular regions. You get a list of topics that people have been searching for over the past 24 hours. It’s prescribed to use this tool in a different way as broadening out your interests.